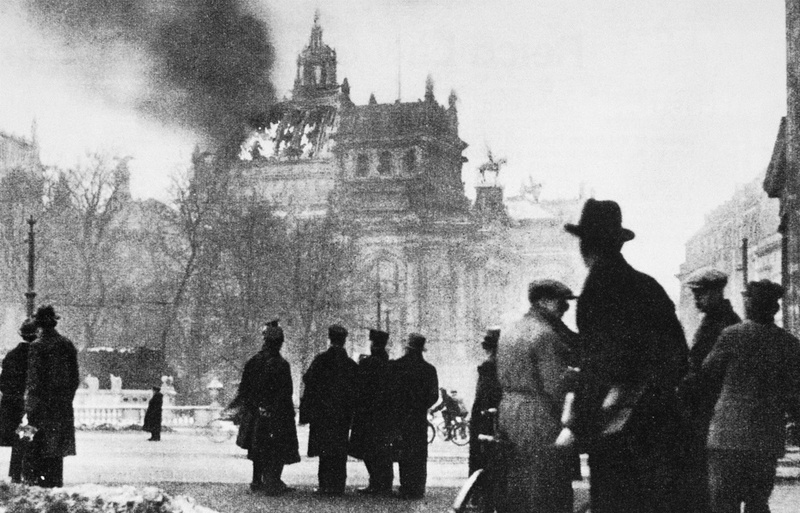 On February 27, 1933, the German parliament building known as the Reichstag was set on fire. The government falsely portrayed it as part of a Communist effort to overthrow the state. The Nazi Party soon passed a decree, "For the Defense of the Nation and State," which removed many of German citizens' civil liberties and made it possible to imprison anyone who opposed Nazi rule. The Reichstag Fire is often seen as a cautionary tale about the fragility of democracy and the struggle to keep it intact. Looking to the past provides valuable lessons about the ways individuals and societies have met these struggles with resilience, courage, and determination. We also, however, must encounter and confront reflections of our own frailties and liabilities as human beings. Studying the Holocaust delivers haunting and frightening insight into the implications of losing that battle. As we draw lessons from history to inform and navigate us through the present, we can ask the essential question: what leads to the collapse of a democracy? There is much for us to learn from the disintegration of the Weimar Republic; and when we teach our students about the rise of Adolf Hitler and the Nazi Party, how do we distill and convey these lessons in a way that gives us insight into human behavior? How will we construct lessons that avoid painting this destructive transition as if it was inevitable? To focus only on a strong-armed dictator and the violent intimidation of paramilitary groups misses the greater range and complexity of individual decisions and actions that includes active collusion and self-interest, conformity and consent, and remaining a bystander in the face of attacks on neighbors. Perhaps we have the moral luck of being born in a different time and place - the privilege of not having to make the difficult decisions and navigate the harrowing circumstances that Germans did in the 1920s and 1930s. Or perhaps we too are engaged in a similar struggle with the spirit and substance of democracy, wrestling with some of the same cyclical trends that undercut faith in one’s government and in each other: politics of resentment, a sense of defeat and waning national prestige, rumors and conspiracies, increasing polarization and a breakdown in civil dialogue, the manipulation of fears about safety and security, questions about the accuracy of information, and an increase in nationalism coupled with growing suspicions and attacks on vulnerable communities. In the 1920s, democracy was brand new to Germany, recently born after the end of World War I. It suggested great promise in expanding constitutional rights, ushered in cultural shifts, and even seemed able to weather economic crisis. And yet, by the end of the decade, it was under fire and at great risk. Many believed democracy weakened the country and they sought the return of national prestige and power they thought only strong, autocratic leaders could restore. After only 11 years of the democratic experiment, progress was halted in the midst of the Great Depression when President Hindenburg invoked emergency powers to bypass the Reichstag and rule directly by decree. Three years after that, Hindenburg appointed Hitler chancellor and Hitler used those emergency powers to dismantle the remnants of German democracy. It's important for students to look closely at this "bubbling cauldron," along with the decisions of individuals, and try to understand what motivated them to consent and conform to changing standards and increasing violence in their communities and country. It provides critical insight into what a democracy requires from us and who is invested in maintaining and strengthening it in the face of ever-present challenges. 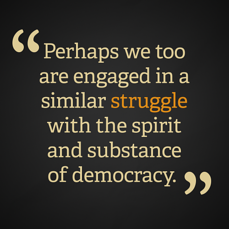 In particular, how can students apply their understanding of democracy in today's world? What elements do they see as valuable and meant to be protected? How can they help safeguard democracy as engaged citizens? Use our reading, "Outlawing the Opposition," from the newly revised version of Holocaust and Human Behavior, to better understand the role of the Reichstag Fire as a turning point in Germany's shift from democracy to dictatorship. Photo caption and credit: Germans look on as the Reichstag building burns on February 27, 1933. Granger, NYC — All rights reserved.